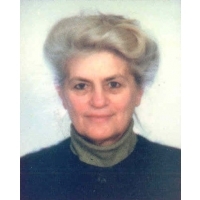 Born in Skopje, Macedonia, Rajna Begović was a retired physician at the time of her death. She was a member of the Haiku Society of Serbia and Montenegro. Her work has been included in a number of haiku collections, journals, and anthologies, and she was the recipient of many awards for haiku, waka, and haibun. She also wrote aphorisms, short stories, and classical poems. She lived in Belgrade, Serbia. 2002); co-author of PreZenT anegdote [edited by Dragan J.
Ristić] (Literary association Sveti Sava: Belgrade, 2007). Credits: "The wind swings" - Honorable Mention, Mainichi Haiku Contest (2001); "Roadside fountain" - Magnapoets 4 (July 2009); "The smell of the sea" - Genkissu! Spirits Up, collection (September 2007); "A yellow leaf flies in" - Second Place, Ito en (2006); "Winter sunshine" - Second Place, Mainichi Haiku Contest (2005); "A petrified snail" - Ginyu 40 (2008).